Where did my HUD-I Settlement Statement go?…The money is there, so why am I waiting 3 days to close on my house?!?! The mortgage industry is changing again, and this time it’s affecting the day you’re actually closing on your home. These recent developments are a result of the Consumer Financial Protection Bureau’s new TILA/RESPA Integrated Disclosures (TRID) Rule, and it’s taking effect for mortgage applications signed on or after October 3rd, 2015. The intention of both document changes is to provide a more consolidated document to the consumer—in an attempt to simplify the process. In addition, it is required that the CD be provided to the consumer a minimum of 3 full business days PRIOR to consummation, allowing them ample time to review the terms and fees of the loan. These changes should be POSITIVE for the consumer IF the correct expectations are set up front! The Texas Association of Realtors is recommending real estate contracts to have closing dates set a minimum of 45 days from contract execution. As we all know, closings can occur “on or before” the date listed, and there is rarely a situation where both parties won’t agree to close earlier if possible. All real estate professionals (including realtors, escrow officers, and lenders alike) need to set realistic expectations for the buyers and sellers, allowing both parties sufficient time to meet the deadlines while still creating the smooth buying/selling experience everyone desires. As with all the new things, there is sure to be a little chaos and a few mishaps at the start, but hopefully there won’t be too many consumers feeling like these changes are of the “end of the world” proportion. Of course, you can save yourself the headache… Working with experienced professionals like Red Team Real Estate and Legacy Mutual Mortgage when buying or selling your next home is the key to a painless process…contact us today, and learn how we can help! Being in the same marketplace has awarded me the pleasure of working with Jenni on several occasions. Each time, I have been impressed by her communication with the client, her focus on closing the deal and most importantly, making sure it’s done right. Ms. Jones was the featured speaker at our local association of NARPM last month and she did such a fantastic job of laying out the CFPB’s changes for us. Thanks again Jenni, all of your information was such a big help! Great organizations deserve to be recognized! Long time relationships that you cherish are to be professed! So…When it comes to longtime relationships, I have been involved with the Ronald McDonald House of Fort Worth for the last decade and have served on the Board of Trustees for the last four years. It is a heartfelt thing for me and I want to tell you about it. As a complete believer in the mission, it is truly the house that love built, the house where all the families with critically ill children can focus on their child’s needs in a time of emotional upheaval and not worry about the day-to-day stuff that tends to distract and take their time instead of being able to focus on what needs to be done…taking care of the child in need. But of course this all takes effort. With opportunities to donate (over 90 percent of the funding comes from you and me, corporate donors and foundations) as well as the volunteers, everyone can find some way to help. The upcoming sold out event which is always a favorite is the Wild Game Dinner. A chance to eat way too much food (and I always do!) and bid on fun things that help the house support the families in need. Even though families staying at RMH are not required to pay anything to be there, we do ask them to donate if they can to pay for the $95/night costs that are incurred. This event is one of two big annual fundraisers. The big Spring event is Ronald’s Roadhouse. Food yes, but also big time music! The inaugural event this past April was a big hit with everyone and completely sold out. Sponsors are already trying to see how they can be part of this coming May’s next iteration. No matter the time of year, the house is in need of items from the Wish List that are as simple as toilet paper and paper towels, to sponsoring of the electricity, or simply the cost of one family’s night to stay at the house. Now, Ronald McDonald is important to me because I am personally involved. But I am a firm believer that those of us who have found success need to give back to the community–our community. 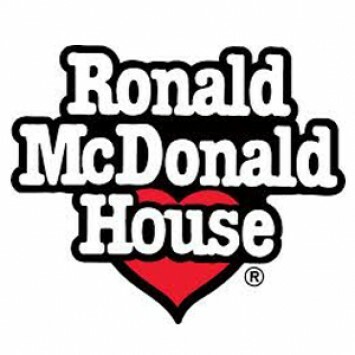 Whether it is a Ronald McDonald House near you or some other non-profit that you feel passionate about, please find some way to give back from the fruits of your labors and help someone in need. By the way, one of the staff members is Mac, the Australian Labradoodle, who is the Director of Love and Comfort! How can it not be a cool organization to be involved with when you have a dog on the team!